Ideally suited for applications when the walls of the building are not capable of supporting the weight of a Flat Screen. The rigid steel construction of this stand makes it ideal for use with Touch Screens which are heavier than conventional flat screens. The majority of the screens weight is directed to the floor not the wall itself. 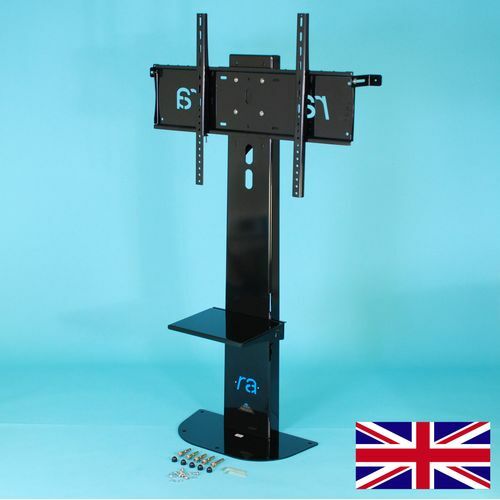 A flat screen can be mounted on the stand at various fixed height settings (please see dimensions below). The central upright support tower is hollow box section design to enable all connection cables to be concealed inside and ensure a very neat & tidy appearance with a cable entry / exit hole positioned at the rear base of the tower. The flat screen can be fitted in Landscape or Portrait format. All Fixed Floor Stands come complete with a full fitting kit including floor anchor bolts with bolt head cover caps & Wall Strap Brackets to eliminate any movement when used with a Touch Screen. Extended Wall Strap Brackets are available to span wall mounted Network Trunking. Product Dimensions. Height from floor to top of tower 1500mm. Width of tower at widest point 230mm. Floor Plate 590mm x 260mm with 5 fixing points. Floor to maximum centre of screen point 1410mm. Floor to minimum centre of screen point 1225. Finished in durable Satin Black, White or Silver powder coating. Weight shown is not including RA LCD Mount or Optional Height Adjustable Shelf.